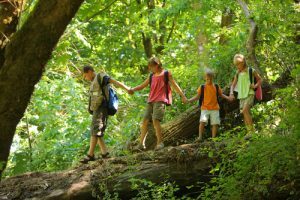 Are you wondering how you can make sure your child in Woodstock GA has a blast this summer? At Discovery Point Woodstock, our summer camp offers children plenty of exciting adventures that allow them to make the most of their time off school. We’re looking forward to having the opportunity to be part of your child’s beloved memories this summer. Our program encourages campers to make friends, discover new ideas, and develop their unique skills in an environment that makes learning fun. Read on for details about what you can expect from our summer camp program in Woodstock GA.
We’ve created a program that promotes early language development through a basis in engaging works of children’s literature. Each week’s literature selection offers a theme for our activities and excursions, adventures that we’ve labeled “mighty missions.” Through these missions, children will discover the superhero within while learning important life lessons that they can bring back to the classroom. “Mighty Me!” encourages hands-on learning through fun and exciting activities that have campers looking forward to something new every day. These themed activities also offer children an opportunity to connect with their favorite literary characters and stories and develop an appreciation of the magic of the written word. Teamwork. Campers learn the value of sportsmanship and being a team player. Friendship. We help children build relationships using kindness and respect. Self-reliance. Campers gain real-life experience that teaches them the value of resourcefulness. Health & physical fitness. We encourage children to understand the amazing machinery of the human body. Creativity. Our projects and activities show the importance of using one’s imagination. Stop by Discovery Point Woodstock or give us a call at (770) 926-5544 today to learn more about our summer camp program for children in the Woodstock GA area.